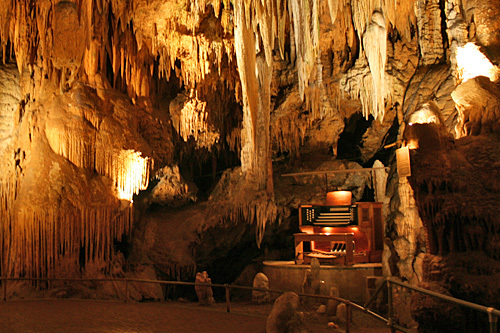 The "Stalacpipe" Organ sits deep within the bowels of Luray Cavern, VA where it relies solely on the surrounding cave environment to produce the musical notes played on its keys. Ever get the urge to listen to geology music? Me neither. But, believe it or not, there are plenty of songs out there about – or containing references to – geologic phenomena…and I’m not talking about the stalacpipe organ in Luray Caverns, Virginia (pictured above). Far from it, in fact. You’d be surprised at the number of songs you can come up with that contain lithical lyrics. Many of which are by well-known, main-stream artists, that you’ve probably listened to time and again. Here is a short list of some of my favorite of such songs, with a portion of the lyrics which make the geologic reference. Look them up and listen for yourselves…I’ve even included youtube links for your listening pleasure (where applicable)! Diamonds and Coal by Incubus – I think this one has a pretty obvious explaination…diamonds = hardest mineral on Moh’s Hardness scale (and girl’s best friend), coal = bioclastic sedimentary rock. Need I go on? Oh My God by Kaiser Chiefs – “Drifting apart like a plate tectonic.” Thirty seven seconds into the song. Technically, the line combines two different competing theories – plate tectonics vs. the previously believed (and now disproved) theory of continental drift – and doesn’t really make sense. But maybe that’s the point. New Madrid by Uncle Tulepo – “Roll me under New Madrid. Shake my baby and please bring her back.” The New Madrid Seismic Zone (aka New Madrid Fault), is a major intraplate seismic zone located in the southern midwest of the United States and is responsible for four of the largest earthquakes in North American history. Sorry California, Missouri has got you beat! Supermassive Black Hole by Muse – “Glaciers melting in the dead of night.” You thought I’d go straight for the obvious and justify that the song title alone qualifies, didn’t you? End Moraine by Sparta – Speaking of glaciers… “I want glaciers to scrape. I want to level this place” and later “end moraine”, a ridge-like geologic feature made up of sediments that are deposited at the end of a glacier as it melts, is mentioned several times. When the Levee Breaks by Led Zeppelin – No quoting…I’d have to include most of the song. Levees are earthen structures designed to keep water within river channels during flood stage. Engineering geologists, like myself, are employed by companies such as the Army Corps of Engineers to design such structures…at least nowadays. Volcano by Beck – I don’t feel it too necessary to really point out why a song titled “Volcano” fits into the category (unless, of course, said song didn’t actually have anything to do with volcanoes, which is not the case here). Volcano by The Presidents of the United States of America – Another song about a volcano! Yes, I know the song is really about musical instruments/equipment…but the metaphors are outwardly intentional and there’s even a video of an erupting volcano towards the end. Earthquake by Family Force 5 – “It’s shakin’ like an earthquake” and “10.0 on the Richter scale.” Granted, this isn’t really one of the best songs you’ve ever heard, but it works. Omaha Stylee by 311 – “What you think is solid earth can jump up and spread out. To the north and south that’s what plates are about.” Another plate tectonics reference, with the first part likely being more about lava. Old Chunk of Coal by Johnny Cash – Coal, again, is a widely exploited natural resource. There are literally tons of songs about coal mining (yes, I’ve weighed them all). I like this one the best. Unfortunately, I couldn’t find any decent “official” videos, so I’ll let you do that search on your own. Cliffs of Dover by Eric Johnson – No lyrics here, just good music. Though, the title is what put it on the list. I know, a stretch that I decided to overlook this once. The White Cliffs of Dover are cliffs along a part of the British coastline facing France. The cliff face reaches over 350 feet in height in some locations and is a striking white color due to its composition of pure calcium carbonate (chalk). If I ever do field work here, I’m picking this song on my iPod, setting it to repeat and hitting play! Transatlanticism by Death Cab for Cutie – “The Atlantic was born today, and I’ll tell you how.” His explanation isn’t quite the standard plate tectonics version…but I like to think that part is implied. Ok, another stretch, but this is just a good song. Of Dust and Nations by Thrice – “And nothing built under the Sun will ever stand before the endless march of sand.” Sedimentary processes in song! This one is for my students who just learned about sed. processes this week (I hope they read this)! Dustin Kensrue is mostly singing about sand burying everything…though the word “march” makes me think more of a mechanical weathering type of process…which would be more devastating in some respect – think of a sand-blasting effect. Rocks and Trees by The Arrogant Worms – They say “rocks” in the song sixteen times and throw in a volcano near the beginning for good measure. Another song without good video (though several amateur attempts have been made). That wraps it up for my favorites, but feel free to send yours via the contact page and I’ll be glad to add them here. I’ll be posting next weekend following my trip to Charleston, SC for the AEG annual meeting, and there should be plenty to share! Enjoy the weekend!